Assessing individual student skills at the beginning of the school year is important for teachers to establish a baseline from which to monitor student growth. This is especially important at the secondary level where we have an influx of students from diverse educational backgrounds all converging into one larger secondary school. Some students come from different states or countries; others from private schools; some from homeschooling; and the rest from public schools. Inevitably, we see a wide range of student abilities and levels in our classes from day one. Therefore, diagnostic assessments at the beginning of the school year are key to getting to know your students and beginning to learn how to target their needs. During the first two weeks of the school year, I have my students complete several different diagnostic exercises, and I catalogue their results on a skills checklist that communicates to students what they need to focus on during the school year. I find that this method helps students to set clear goals at the beginning of the school year because they can identify precise skills standards to target throughout the school year. Through diagnostic testing, I assess students' reading, writing, speaking, and listening skills in order to gain a complete understanding of how my students will perform, where they will struggle, and what skills lessons I will need to include in reading/ writing workshops. In order to assess student speaking skills and to learn more about them as individuals, I have students give short, 1-3 minute introductory speeches in which they introduce themselves to the class and share unique details about their lives. Students may be nervous about giving a speech at the beginning of the school year, but it's a great way to learn more about students. I like to take notes during these speeches about my students. I write down unique facts, details, interests, and activities next to their names on my roster sheet because associations help me to remember names. This is especially helpful at the secondary level where we have 150-175 students at a time. Although students may be nervous, I can get a quick sense of their personalities, confidence levels, and speaking skills in less than three minutes. Before giving these short speeches, students outline what they're going to say, and they can use their outlines during the speech, but I encourage them to use their notes as little as possible. I also have them practice in small, rotating groups around the room before we share as a whole class. This activity also helps to build a classroom climate rather quickly. While it may sound like an intimidating assignment right at the beginning of the school year, I make sure to keep it casual and fun, and I emphasize with my students that no one is being graded. 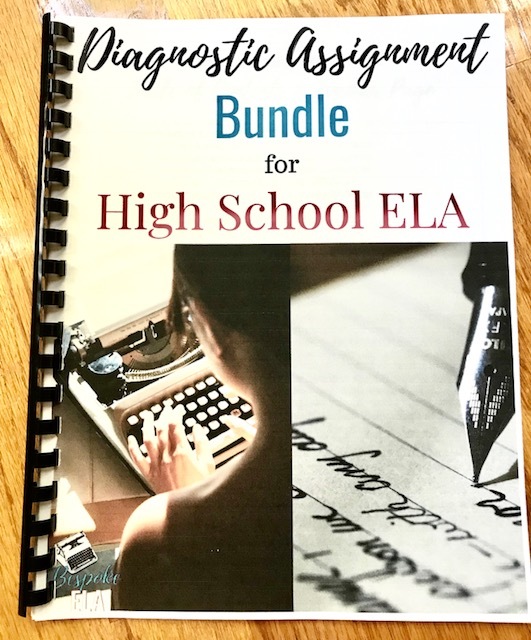 If you would like a copy of this assignment that is ready-to-print and use, check out the Diagnostic Assignment Bundle for High School Students here. "Annotate this poem for literary, figurative, and stylistic devices. Then, write a 3-5 sentence summary of the poem that includes the theme." First off, this assignment will show me how well they can annotate a text as well as their ability to recognize key devices and style elements. If the poem contains three similes, and the student has not made a note of this device, I can assume that the student may not know the term or device. If the poem contains a series of repeated words, and the student has not annotated this section, I can assume that the student didn't see it or did not realize that repetition is a key tool writers use to communicate a message. Secondly, the summary portion of this assignment will show me their level of comprehension in a succinct format that takes me minutes to assess. Literally in one minute, I can skim read the summary and see if they comprehended the poem or not. The theme statement also helps me to understand their ability to analyze a text. I am looking to see that they can take their analysis to the thematic level and interpret a text correctly. I like this assignment because I can either check the "yes" box (they got it), or the "no" box (they didn't get it). This quick assessment helps me to see where they are, and I also use these assessments to group students for future activities according to their various skill levels. In the Diagnostic Assignment Bundle for High School Students, I have included a close reading poetry assignment using "The Tyger" by William Blake, which is a poem that is accessible to students but contains a complex message about the nature of existence. In order to assess student’s listening skills, I like to have them listen to a Ted Talk and assess the speaker's message as well as how effectively the speaker delivers that message. I have them take notes and answer questions about the thesis of the speech, the main points of the speech, and the most memorable part of the speech as well as the speaker's voice, gestures, and use of technology. After students view the Ted Talk, we discuss these things as a group, and I have them turn in their listening guides so that I can take a closer look at what they heard when we listened to the speech. I have also given this assignment to my students as homework and allowed them to go home and select a Ted Talk of their choice to listen to and assess. It really depends on your curriculum map and how much time you have to do an activity like this at the beginning of the school year. But it is another way to provide a lens into student skill levels. I have included this Ted Talk listening guide in the Diagnostic Assignment Bundle for High School Students. The diagnostic paragraph is a key component of the diagnostic process for my classes. I save this assignment for the end of the diagnostic period towards the end of the first or second week of school. For this particular assignment, I like to give students a persuasive topic such as healthy school lunches, and I provide them with a bank of evidence that can be used to support that topic. I then have them write a persuasive paragraph using textual evidence with sound logic and reasoning in order to support their claim. I have them write this paragraph in class so that I know for sure it is their own writing without any help or support from anyone or anything. This paragraph gives me a lot of information about each student's writing abilities. It shows me what they know about paragraph structure, blending quotes, analyzing evidence, and much more. It also shows me their ability to create a concise argument in a timed context because I have them write this in class. It’s also a short enough piece of writing that it doesn’t take me a long time to skim read and get an overall impression of each student's writing abilities. I have included this persuasive paragraph assignment in the Diagnostic Assignment Bundle for High School Students that gives students the task of creating an argument for healthier school lunches. There are various ways to assess these diagnostic assignments in order to create the baseline of skill levels for tracking purposes. I am a big fan of checklists with diagnostic assignments. They are very easy for the teachers to use and easy for students to read. Typically, I use a Common Core Checklist of skills as my record sheet for these diagnostic assignments. As students complete each assignment, I record all of my thoughts and findings on the Common Core Checklist. Each student has his/her own checklist, and I will check off the specific skills that students need to focus on throughout the school year. However, there are other ways to assess these components. You could create a checklist or specific rubric for each component separately with its own criteria. Instead of having one overall master sheet, you could also have four separate rubrics plus the master checklist. You can also think about assigning points to each of the components. Since there are four assignments here, you could assign each component a score out of 25 points in order to come up with a power score out of 100. However, I do not recommend that these scores go into the grade book as anything other than class participation grades since they are diagnostic. After assessing the diagnostic series at the beginning of the school year, I always give all the diagnostic work back to my students with the checklist(s), and I have them keep these items in their writing folders. Students then reference these diagnostic samples at the end of each semester so that they can reflect back on what they’ve learned and how they think they have progressed on the skills that they needed to work on from the beginning of the school year. In the Diagnostic Assignment Bundle for High School Students, I have included two checklists that I typically use. One of them is the Common Core Checklist, and the other is a checklist specifically for writing. The Diagnostic Bundle also includes two assessments specifically for grammar and also a full literary analysis diagnostic essay that I typically use only with my honors and Advanced Placement students. I tend to do the paragraph diagnostic assessment for my on-level classes. The bundle contains all of these assignments so that you can use what works best for your students and levels of classes. Do you give your students a diagnostic at the beginning of the school year? Find these tips and more at BespokeClassroom.com.